Flooding on Loop 12 at I-30 in both directions in Dallas. The following is a news release from the City of Dallas. The City of Dallas Emergency Operations Center remains at a Level 3 (Monitoring Status) and is assisting in the coordination of response by multiple city departments to the flooding that happened overnight in Dallas. The City of Dallas received about 6.8 inches of rain in Northeast Dallas overnight. The lowest rain total in the city was 1.5 inches in far South Dallas. 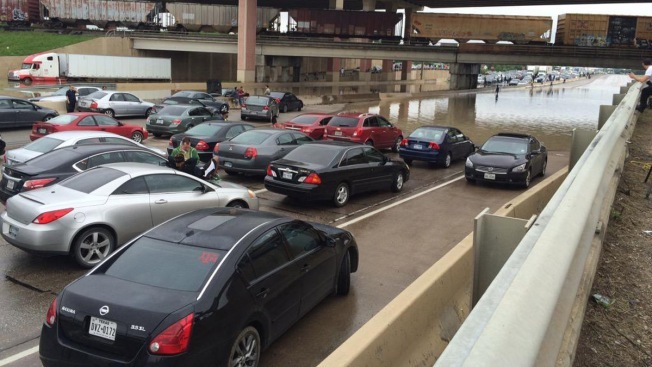 In the overnight hours and into early morning, both the Dallas Police Department and Dallas Fire-Rescue Department conducted numerous rescues of stranded drivers in the city. We have no casualties or major damage to property to report at this time. The 3-1-1 Center and the Department of Streets Services continue to field calls of high water from citizens and are working to ensure that flooded roadways are barricaded to ensure the safety of drivers. We continue to be in close contact with the National Weather Service, U.S. Army Corps of Engineers, and the Trinity Watershed Management Department to prepare for any impacts or river flooding as a result of this recent rainfall. A Flood Warning remains in effect for both the Trinity River and White Rock Creek, however, our Flood Control system continues to operate as designed to protect citizens from flood waters. Water department vehicles are en route to tow DFR firetruck. Wreckers are also en route to tow two DPD squad cars stranded due to high water. A number of traffic signals are flashing. The City of Dallas continues to stress to people to not drive into water on roadways, or to drive around barricaded roadways. These barricades are put in place to protect lives and property from dangerous flooding.